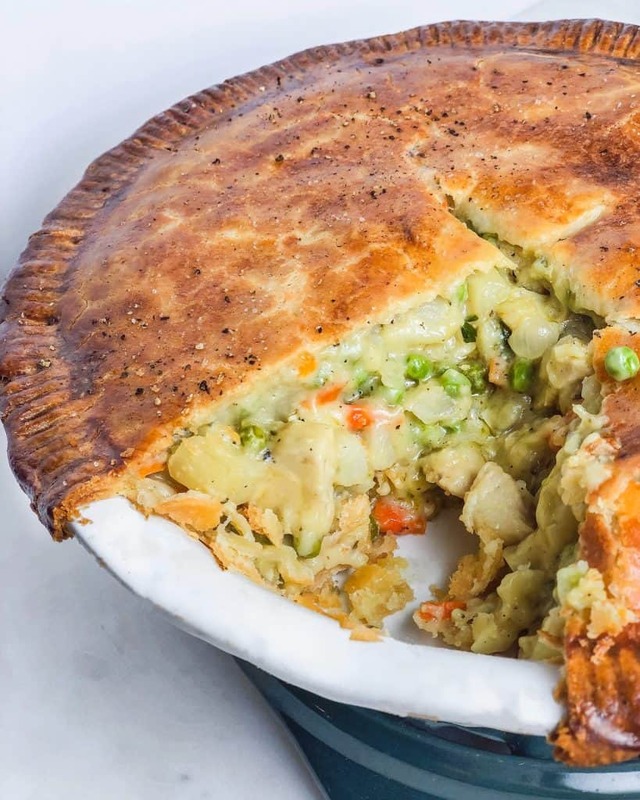 Oh chicken pot pie… so many childhood memories, it kinda begins and ends there though. 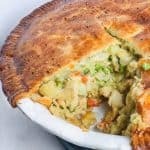 I remember having chicken pot pie as a kid, but never in my adult life. Obviously that means I’ve never cooked it myself and figured it would be an epic failure, but it turned out to be one of my favorite dishes! First, we prep. I used yukon gold potatoes, peeled, and diced them (2 cups). 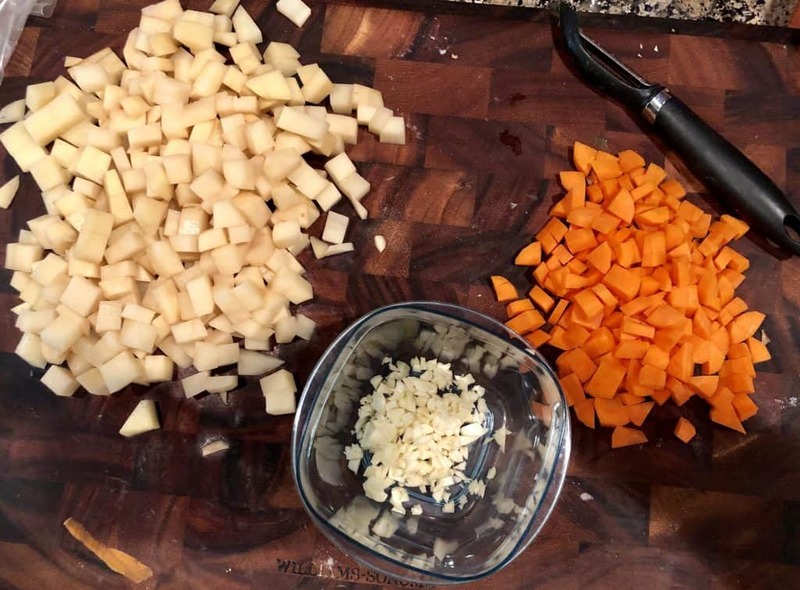 Next I took 2 carrots, peeled, and diced those (1 cup). Obviously garlic, took 2 cloves, and minced (1 tbsp). 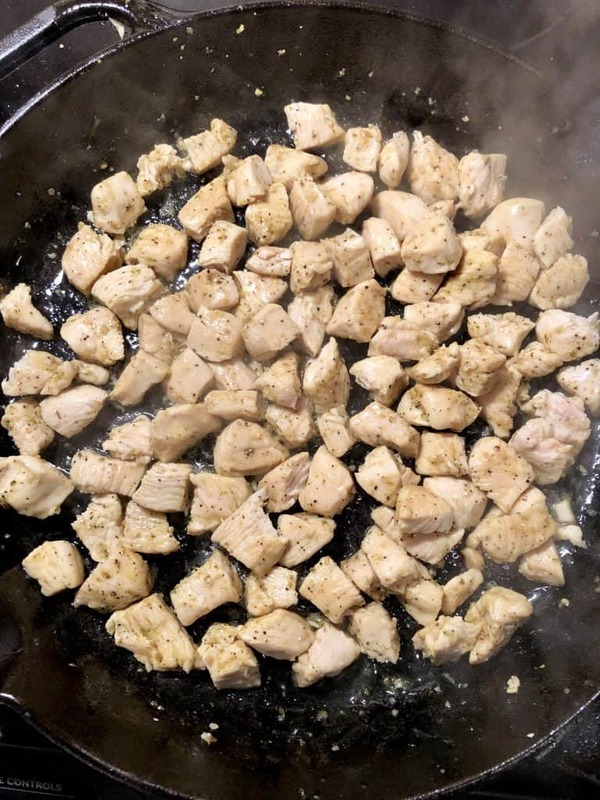 I took 1 lb of boneless, skinless chicken breast and cut them into cubes. You can also use a rotisserie chicken and shred it to save time. If you’re cooking the chicken though, I seasoned it with some adobo seasoning and cooked it in my cast iron until fully cooked through. 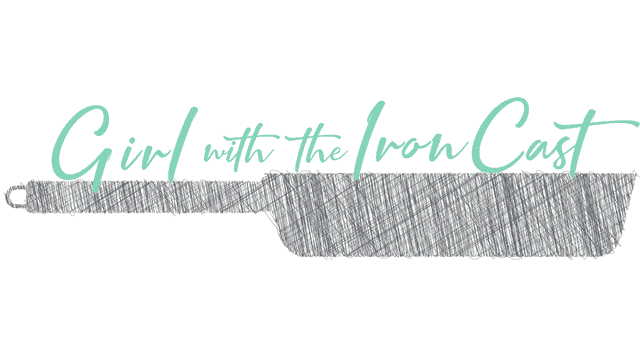 When it’s done, remove it and set it aside. You can simply season it with salt and pepper if you don’t have adobo. 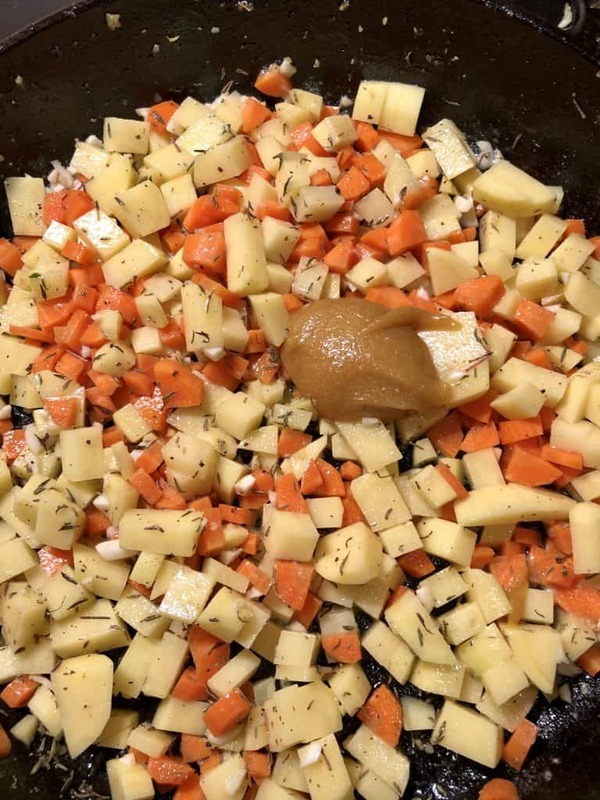 Continuing with the stuffing of the pie, we are going to sauté the carrots, potatoes, and garlic. We are going to add the thyme, 1/4 tsp of fresh ground black pepper, and the flavor bomb of the pie………. …. a big tablespoon of Better Than Bouillon paste. We have talked about this umami bomb in my chicken soup recipe. This is going to add a depth of savory flavor that will set the pot pie apart. If you don’t have the paste you can crumble a bouillon cube, but I have been enjoying the paste and how well it absorbs. You’re going to let the vegetables sauté for 8 minutes (I covered with some foil or if you have a lid) so the potatoes and carrots begin to soften. We are going to add back in the chicken, frozen peas, and some fresh parsley. Next comes the most important part, the flour/liquid combo. A lot of recipes use heavy cream, but I wanted to lighten it up with a combo of 2% milk and chicken broth. I would have uploaded this recipe 2 weeks ago, but I forgot to measure exactly how much I put of each (*facepalm*). Twist my arm I had to make this again just to measure the liquid and flour. I ended up with 1/3 cup all purpose flour, 1/2 cup 2% milk, and 3/4 cup low sodium chicken broth. You’re going to bring this to a boil then turn the heat to simmer and stir until it thickens, see below. Remove from heat. There are lovely recipes out there that you can make your own pie dough, but I went the easy route. Feel free to make your own though. 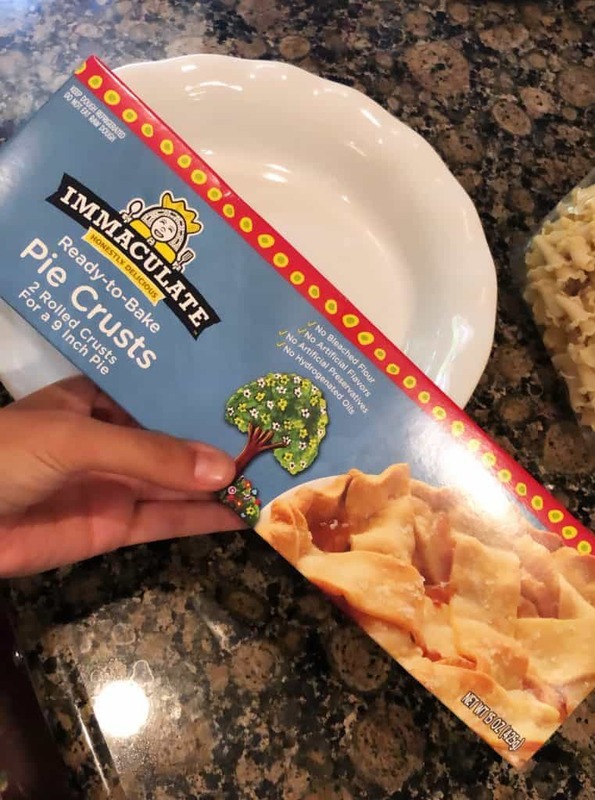 Most pre-made pie crusts come with two which is perfect. One mistake I made the first time, I didn’t wait for the dough to come to room temp so it cracked a lot (I’m not the best at paying attention to instructions on food boxes). I sprayed some coconut oil on my pie dish and unrolled the first pie dough into it. My pie dish was the exact dimensions of the pie dough, but if your dish is smaller you can flip the dish over and cut around to ensure the proper size. Lightly press it down to the cover the dish. Then we are going to spoon in all the filling. Grab the other pie dough and carefully roll it over the top. In a small bowl you’re going to whisk 1 egg + 1 tbsp of water and brush it over the top of the pie, covering all of the dough. Using a fork or your hands, press the edges down to ensure the crust stays attached to the bottom crust. Cut a vent in the middle to allow the steam to escape. I add a little salt & pepper on top for a little extra something something. Let it bake for 30-35 minutes until the top is golden brown. Remove from the heat and let it cool for 10-15 minutes before serving so the inside sets. Slice, serve, and enjoy! …and the leftovers are even more flavorful the next day! 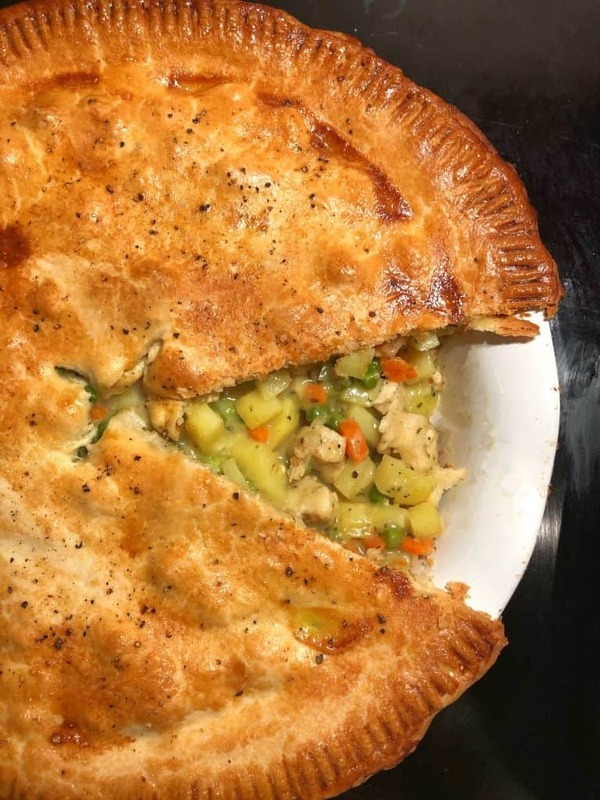 The most flavorful chicken pot pie with vegetables and juicy chicken. 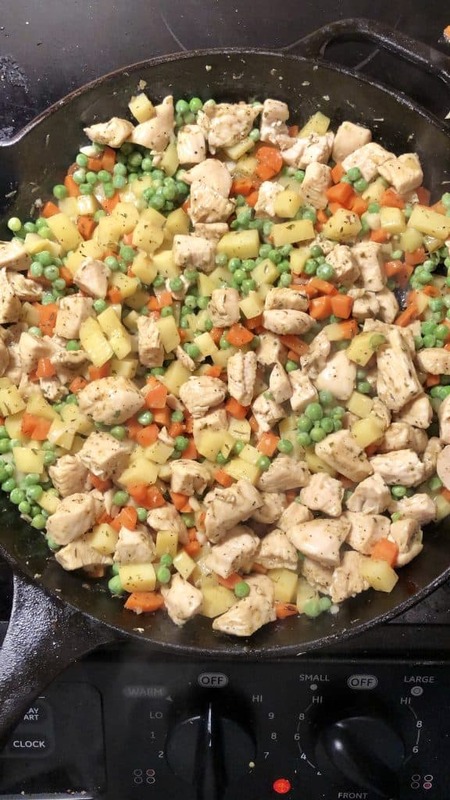 In a large cast iron (or regular skillet) over medium high heat, add 2 tbsp of olive oil and the chicken. Add seasoning and brown chicken till fully cooked through. Remove from skillet and set aside. 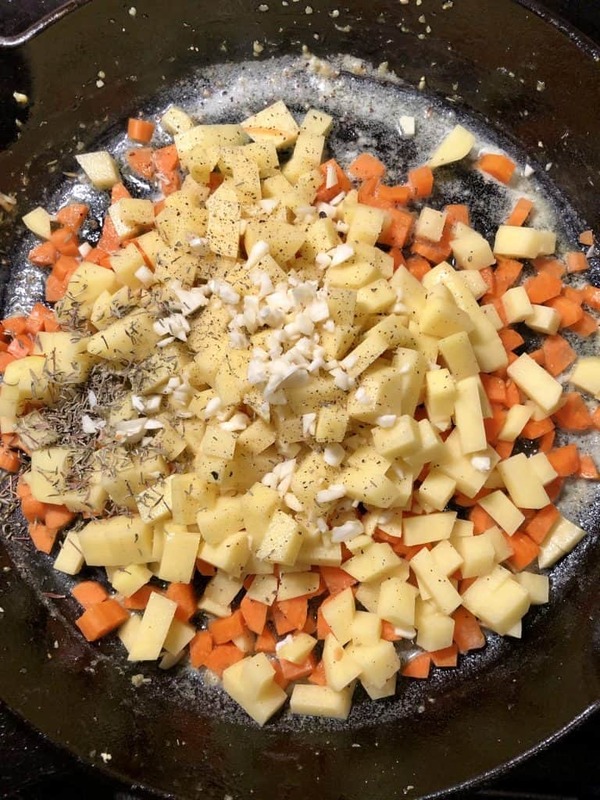 Lower the heat to medium, add 3 tbsp of butter, carrots, potatoes, garlic, thyme, 1/4 tsp black pepper and bouillon paste. Sauté for about 8 minutes until carrots and potatoes begin to soften (you can cover with foil/lid to assist). 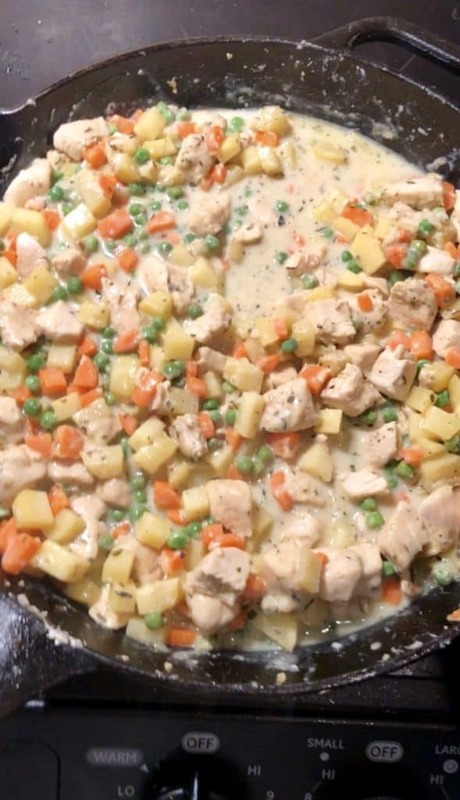 Add back into the skillet the chicken, add the frozen peas, and fresh parsley, stir to combine everything. Sprinkle the flour over the mixture and carefully mix. 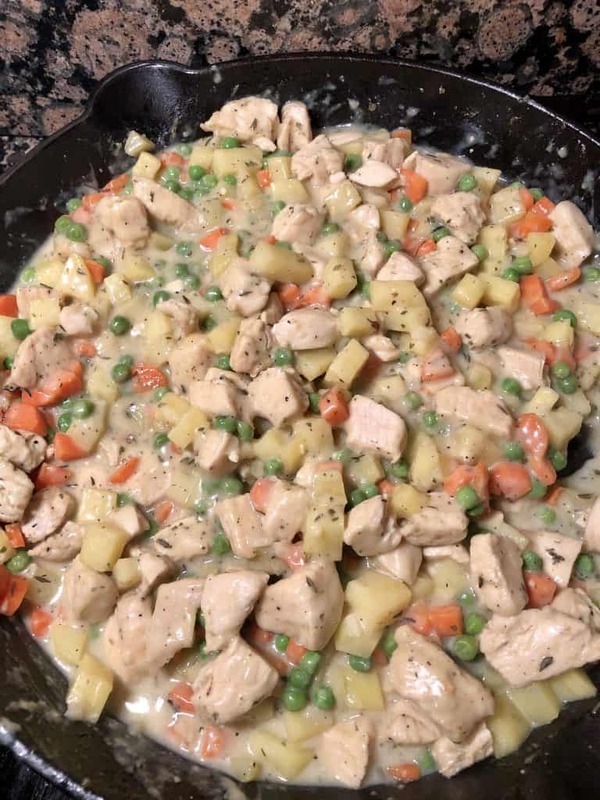 Once flour is mixed in, add the milk and the chicken broth and carefully mix all the ingredients. Bring to a soft boil, about 5 minutes. Once the mixture reaches a boil, lower the heat to simmer and gently stir until sauce thickens, 3-4 minutes. Remove from heat. In a 9 inch pie dish, spray some non-stick cooking spray, and gently roll your pie crust into the pie dish. 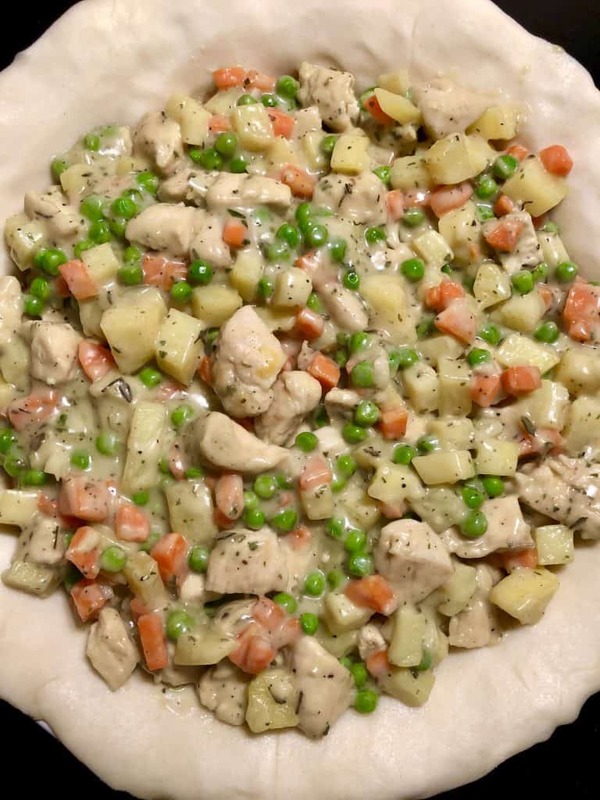 Gently press the dough into the dish to ensure it’s evenly spread and reaching to the ends of the pie dish (you may trim the ends hanging off if needed). Add the pie filling to the dish. Take your second pie dough and carefully roll it over the filling. 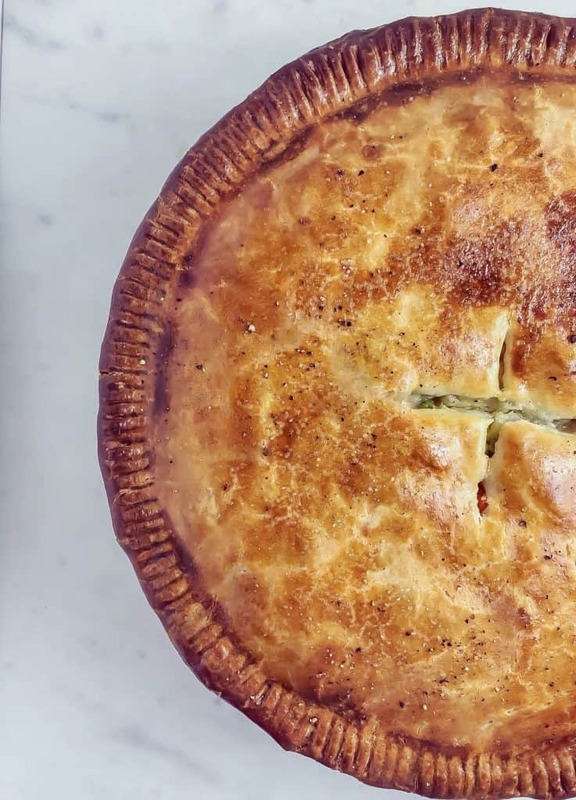 Using a fork or your fingers, press the edges of the pie dough down so it seals the edges. In a small bowl whisk the egg and 1 tbsp of water. Using a brush, carefully brush the entire top of the pie dough with the egg wash. 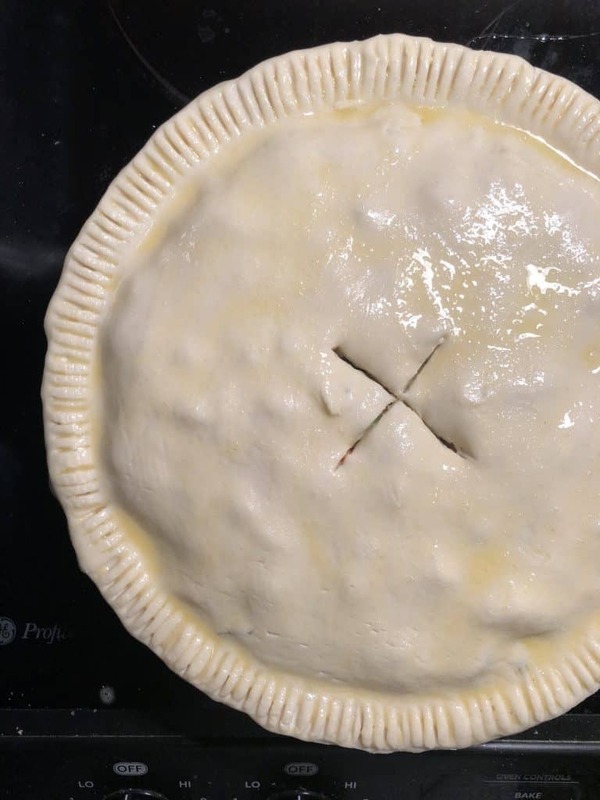 Using a knife, cut a “+” in the middle of the pie as a vent to allow the steam to escape. Sprinkle a little salt and fresh ground pepper on top of the dough. Bake for 30-35 minutes until the pie crust is golden brown. Remove from the oven and allow to cool for 10 minutes before serving. Allow the pie dough to come close to room temperature before handling, so it does not crack or break when opening it up. I had a 9-inch pie dish for the 9-inch pie dough, if your dish is smaller you can trim the ends if needed. You can substitute adobo seasoning for the chicken with just salt & pepper if desired.